Large enough for five couples or a small business retreat, Tom Tom Villa is the perfect home away from home for up to 10 guests. Located in a secure gated community, Tom Tom Villa offers open style living at its finest. Guests can visit in the oversized living space with its Asian accents, or take the party outside onto the covered terrace to enjoy the views of the Caribbean Sea. Days can be spent lazing around the infinity pool or five minutes down the road for the best that Holetown has to offer. With duty-free shopping, restaurants, bars and night clubs, there’s something for everyone! In the evenings, try dining alfresco as the sun sets over the water, then make a toast as the sky fills with stars. 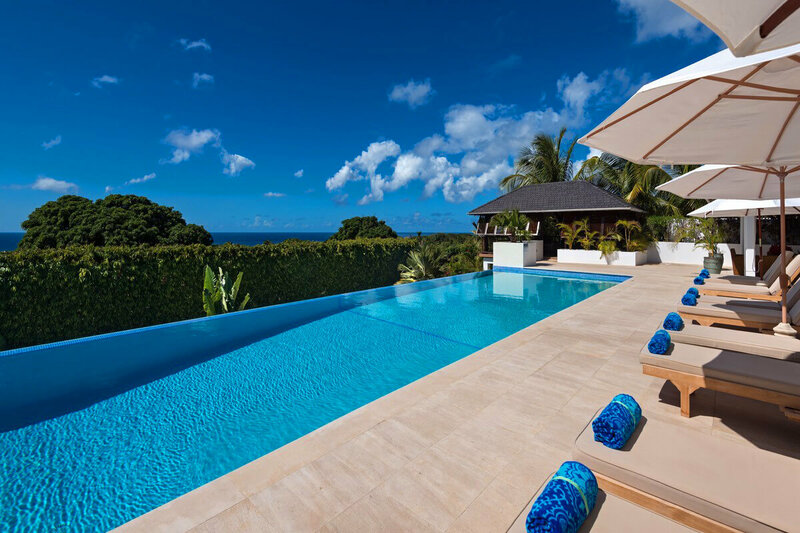 Tom Tom is a 10,250-square-foot, 5-bedroom villa located on a ridge overlooking the west coast of Barbados. Located within the private, gated neighborhood of Calijanda Estate, and in the district of St. James, Tom Tom’s immediate neighbors are the famous Royal Westmoreland and Sugar Hill Resorts with Sandy Lane within close reach. With natural coral stone walls, wooden floors, and custom made furniture imported from Bali and Indonesia, the living room opens onto the outdoor terrace complete with a large infinity-edge pool and uninterrupted views of the Caribbean Sea. After sunset, when the pool is lit, guests can enjoy a cold cocktail while gazing up at the stars. There are five bedrooms: four king-size four-poster rooms with en-suite baths and a twin bedroom with en-suite bath. Two of the suites feature four-poster beds and their own outdoor tub in a tropical courtyard that creates a spa-like atmosphere. Or guests can take in the breathtaking views from either of the two master suites each with their own charm. The fifth suite has a courtyard and twin beds. * Just a five-minute drive to Holetown for local shops, a supermarket, and a large choice of restaurants. * The airport is a 35-minute drive away.